It is finally time to review my most anticipated album of the year. VOLA, from Copenhagen, stands as one of the most exciting bands within the modern progressive metal scene right now; a beacon of originality in a genre that seems to be on the verge of over-saturation with every copy/pasted 8-string, syncopated-riff-writing band that comes out. Some high praise, I know, but the band has fully deserved it ever since the release of their fantastic début record, Inmazes. The project sounded rather ridiculous on paper: mixing the intricate melodic indie-rock sensibilities of Mew and the pummelling, mind-bending grooves of Meshuggah into a cocktail that could’ve just as well turned sour. But in the end, it turned out to be a thoroughly refreshing sound. It’s been over three and a half years since I first heard that stroke of genius, and the anticipation for this new album, with the very non-metal title of “Applause of a Distant Crowd”, reached boiling point with the release of the monstrous first single, “Smartfriend”, which also is arguably by far the heaviest song the band has produced to date — a mammoth track of dramatic and dark choruses, grinding synth leads, roaring bass tones and extremely cool cymbal grooves, complete with quite possibly the most headbang-worthy breakdown of the year, giving Meshuggah a run for its money in terms of sheer groove factor. But if you were expecting most of the album to have this same crushing quality to it, I am afraid you will initially be disappointed, just like I admittedly was myself upon spinning the record for the first time. It is instantly clear when the first track “We Are Thin Air” starts, that VOLA have definitely changed it up this time around instead of making a direct continuation of “Inmazes”, as a more rock-sounding, straight-forward guitar riff comes in alongside new drummer Adam Janzi’s groovy hi-hat beats. The production also seems more toned down in favour of a more organic and atmospheric approach in contrast to the loudness found on the debut. Don’t get me wrong though, the Mew-like vocal melodies are still here, the synth and bass still are right in the front in the mix, and it all very much still sounds like VOLA. But it is also pretty clear that they are exploring new territory here. That exploration continues on second single “Ghosts”, in which the synth definitely takes the main focus with a simple, entrancing staccato synth melody from Martin Werner playing on top of big, drawn-out chords. This track is probably the closest the band has come yet to playing something radio-friendly, which in itself is not a bad thing. Asger Mygind’s vocal work is fantastic in the chorus and the verses are incredibly calming to listen to, with buttery smooth bass lines courtesy of Nicolai Mortensen. But I have to admit, this track was definitely my least favourite for a while, due to the synth lead being so high in the mix and in pretty big contrast to everything else that’s going on. It sounded grating to me at first and to some extent still does, but it has been growing on me steadily with repeated listens. Like many others have pointed out by now, it seems the main influences this time around have come from Devin Townsend, but also from one of my personal favourites, Steven Wilson, while still keeping that signature VOLA sound tucked in. “Ruby Pool” definitely reeks of Wilson but in every positive sense. The melodic writing at play here is simply fantastic, from the swingy bass and soothing vocal harmonies, to the arpeggio piano and the first real guitar solo the band has played as of yet (as far as I remember). This song definitely evokes the images of the cover art (again, a very non-metal looking cover, but very fitting) like floating around weightless and submerged in a calm and light-filled pool of water. “Vertigo” brings me back to some of the mellow vocal -focused tracks of Porcupine Tree’s discography, like “Heartattack in a Layby” from “In Absentia”. Asger’s fragile voice becomes incredibly chilling here with the words, “Don’t be afraid of this memory / We made the greatest noise, didn’t we?”, and while there is no explosive finale or any drums present here, it still serves as a very memorable moment on the album. “Still” brings back Townsend in full force in a track utilizing a wall-of-sound through the bass and guitar alongside glitzing, bright synths, yet also a simpler melodic structure which still retains effectiveness through a powerful vocal performance. Also “Whaler” continues the Townsend worship in the intro riff, and this track is definitely the heaviest among the lot alongside “Smartfriend”. If you’re not making an angry face in approval during those first one and half minutes, you’re made of stone, my friend. What is most impressive to me in this track, however, is the completely seamless transitions between the lighter melodic passages and the doomsday-sounding chugging, and it provides an epic pseudo-finale to the album before the short and mellow piano ballad “Green Screen Mother” wraps it all up. The end result is an album that was nowhere near what I thought it would be, and had I reviewed this after my first playthrough the score would have probably been quite lower. But like any good, truly progressive record, “Applause of a Distant Crowd” demands repeated listens before it really opens up to you, and while the album is less focused on those massive-sounding grooves that people including myself grew to love on “Inmazes”, there are lots of layers and interesting musical directions to be found here. If you can get over your first human instinct to dislike change, I am sure you will come to appreciate the sounds present here. 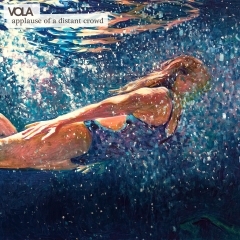 While “Applause of a Distant Crowd” isn’t the utter masterpiece I was expecting upon first hearing “Smartfriend”, VOLA still retains the position of being one of the most interesting and innovative bands that Denmark has produced in many years. It is now impossible for me to tell what the next effort will sound like, and hopefully it doesn’t take another four years to get a glimpse of the next stage in VOLA’s evolving sound.